"After every match or training session I would pee blood." At just 24, reported Manchester United and City target Saúl Ñiguez has already been through a hell of a lot. He has played 150 times in La Liga for the club he joined as a teenager, won the Copa del Rey, the Supercopa, the Europa League and been a Champions League runner-up. He won the Golden Boot at the Euro Under-21 Championships. He even left Real Madrid as a teenager. More unusually, he also played for two seasons with an internal catheter, after a freak collision left him with a kidney haematoma on his ​Champions League debut against Bayer Leverkusen back in 2015. Saúl later described the pain on Spanish TV (via ​AS) and how he would literally urinate blood after every training session and game, as he 'gambled' with his health, such was his desire to continue competing. The all-action midfielder comes from a family of professional footballers. His brother Aaron (five years Saúl's senior) was once touted as a potential superstar after coming through at Valencia, before tearing his knee ligaments. Saúl's incredible determination meant that not only did he not fade away like his brother and so many other young players with serious injuries, but he actually used it to propel him on. "What doesn't kill you makes you stronger... I actually played very well with it [the catheter],” he told Sid Lowe in a ​Guardian interview in 2017, after revealing that he once pleaded with the doctors to just take his kidney out. To those outside of Spain, Saúl is still something of an enigma. His solo effort for ​Atlético Madrid against Bayern Munich in the Champions League semi-final of 2016 (a goal scored with the catheter firmly in place) briefly lifted him to global prominence, before he became just another name in the long line of hugely talented but basically indistinguishable Spanish talents who haven't left the Iberian peninsula. It is quite easy to ignore Saúl as a Premier League introvert. The first ports of call for Manchester United and City fans reacting to the recent ​transfer links (Wikipedia, Transfermarkt and WhoScored) don't yield much enticing information. Instead, they seem to tell you that he is not much of a goalscorer, nor an assist maker. He does not have teams built around him and he doesn't even really seem to have a fixed position. He didn't have the most effective of World Cups last summer and with a €150m buyout clause, he seems like one hell of an expensive backup for Fernandinho. However, he is more than that. Much more. In Saúl, ​Atlético Madrid have a player who couldn't be more suited to Diego Simeone if he was created in a lab; a warrior who can (and has) played in every outfield position and do so with lung-busting hunger, skill and intelligence. On loan at Rayo Vallecano, Saúl was a centre-back, with Spain Under-21s he was an attacker, with the seniors he is box to box, and for Atleti? Well, he has had every last drop of blood squeezed out of him in a deep midfield role, out wide and even covering at left back. His famous Champions League goal against Bayern nearly three years ago typified the kind of rare talent he is, combining the legacy of tiki-taka with the drive and strength needed to break the lines in the years since Spain ruled the world. As an example of just how all-action Saúl is, he is in the top three at Atleti this season for: dribbles, passes, shots and tackles. With big summer spending predicted from both, Barcelona and Real Madrid would surely take Saúl in a heartbeat, but Atleti would likely hold their rivals to the contractual buyout clause. That leaves named suitors and rivals ​Manchester United - who have supposedly been tracking Saúl since his Rayo loan days - and ​Manchester City, who were tipped to complete an ​€80m move just a few weeks ago. 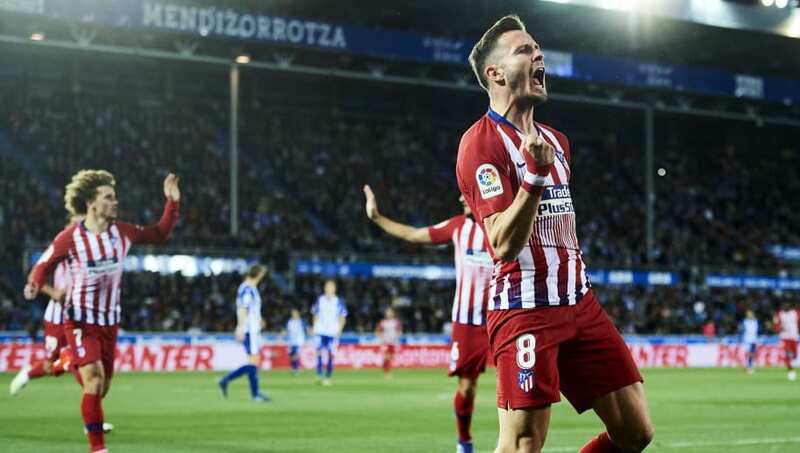 With Lucas Hernandez confirmed to leave and Antoine Griezmann and Diego Godin's futures still up in the air, there is something of a feeling of an end of an era at Atletico and maybe the time is right for Saúl to start earning the global recognition he deserves. He's given blood for his career and now could be the time to reap the rewards. Should a transfer battle ensue this summer, Saúl is a player worth busting a gut for.